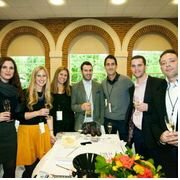 A ThirtyFifty wine tasting is great fun as a team building activity or a social evening for teams to get to know each other and bond as a team outside of work. Our tastings are pitched at just the right level to ensure everyone leaves with additional wine knowledge but importantly has a good time. We have a number of different formats to suit a range of occasions, from our Silver, Gold, Platinum or Fine Wine tasting packages to our Wine Apprentice and Interactive Wine Tasting Show. Tastings can be held at any time of the day or evening - at your offices or at an off-site venue. A fun wine tasting for small or large groups that can either be run as a standalone event or before, during or after dinner. Choose one of our Corporate Wine Tasting Packages below to suit your budget. While the format is the same the different prices reflect the quality & price of the wine you'll be tasting. Suitable for groups of 10+, with guests usually seated at tables. The wine tasting can be held at a venue of your choice, e.g. a hotel or conference centre, or at your offices. For venue ideas please visit our venues page. Contact us on 020 8288 0314 or by email to obtain a quote or to make a booking. Many thanks for the wine tasting on Thursday - it was a very enjoyable and interesting experience for the participants. The teams came up with presentations and some of them were really creative and fun. It was nice to have the short wine tasting session before the group started their team exercise. Jane, you provided the necessary wine expertise both during the wine tasting session and during the team exercise, so I'm very happy with the results, and the client is happy too.